Bevill State Community College – Jasper, Ala. 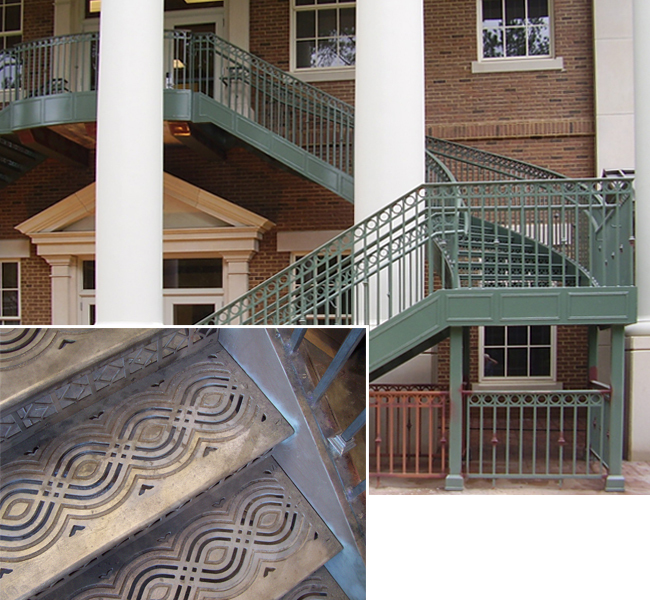 The curved twin staircases outside the Mathematics and Science building at the Jasper campus of Bevill State Community College perfectly complement the columned portico of the classically inspired building. The grand staircases are the result of the equally complementary partnership between the designers at Humphries & Jones Architects, the fabricators at Robinson Iron and Clarksville Foundry, which cast the stair treads for Robinson. Rising nearly twenty feet from the first to the second floor, each staircase features custom cast iron treads with waterjet cut steel risers applied to structural steel. Clarksville Foundry cast the 57 treads for the staircase, each featuring many small, detailed openings. Because the treads are a highly visible component on the project, it was critical that the openings be clean and crisp. 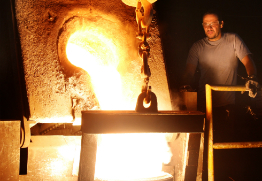 The tread castings were completed over an eight-week period, with interim shipments of completed elements during the process. The Foundry also cast seven posts for the project. The staircase components were fully assembled on the shop floor at Robinson Iron then partially disassembled for finishing and installation.